The CombiWhale – a vacuum tanker with simultaneous jetting and vacuum capability designed and built especially for the Indian market – has been supplied to the Erode City Municipal Corporation in the state of Tamilnadu, by Whale Enterprise. Whale Enterprise PVT Limited, who are a wholly owned subsidiary of Whale Tankers, are this week exhibiting at the IFAT India trade fair for the Water, Sewage, Refuse and Recycling Industries in Mumbai. 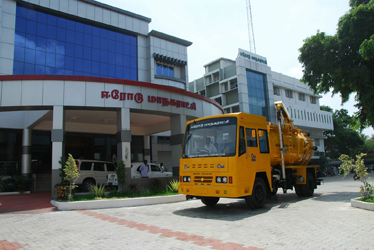 The CombiWhale was commissioned by Erode City Municipal Corporation – an organisation who had previously never owned a vacuum tanker, instead choosing to hire in equipment from private operators. With sewer blockages a common and frequent problem across Erode City, the corporation found that the hired tankers they were using were increasingly unable to clear these blockages, causing an ongoing problem over several months. Using the latest European technology, Whale Enterprise designed the CombiWhale specifically to be able to clear and remove these problematic blockages quickly and efficiently, being able to clear even the heaviest of them at the first attempt. Mounted on a 16 tonne Tata chassis, the CombiWhale is a powerful, multi functional drain cleaning and jetting vehicle, ideally suited to working in narrow streets. It comes equipped with high pressure water jetting to clear private drains, with the vacuum tank also used to empty septic tanks. The CombiWhale has a tank capacity of 9,000 litres, with a 6,000 litre clean water capacity for jetting and 3,000 litre capacity for sludge. In addition to the powerful jetting pump and MISTRAL continuous duty vacuum pump with AIR-BALLAST Cooling, the tanker also includes many features to take both the performance and health and safety compliance to a European level.